Welcome back to our Back to School Block Party for week 3! This week is all about parent communication. Honestly, this is one of the MOST important pieces of our jobs as special educators. If you don't establish good parent communication and rapport in the first few weeks of school, your year likely won't run as smoothly. I want to make sure my parents feel comfortable sending their little ones to me each and every morning! 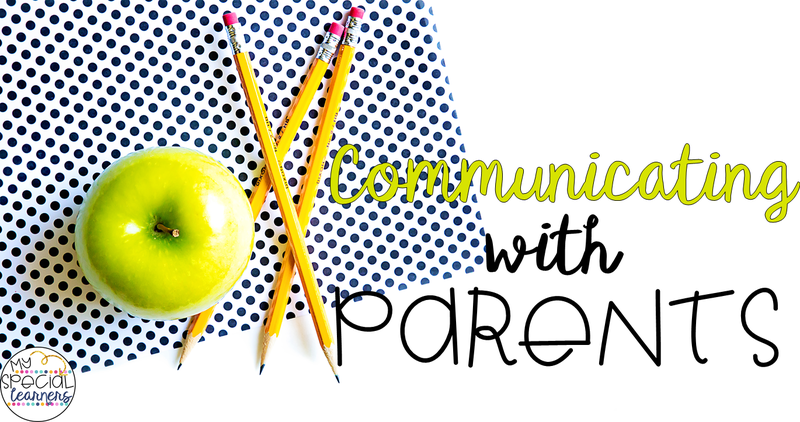 Below you will find 4 ways I plan on communicating with my student's parents this school year (and they aren't the ONLY ways!). OK, I feel like this one is pretty obvious. E-mail is a great way to keep in contact and communicate with parents. (Although I have to admit that I'm pretty terrible about e-mail, I'm working on it!). This year, I'm blessed with 6 new kiddos. Our school has an open house but honestly, I'd rather not meet the families during open house. It is WAY too crazy and I don't feel like I get any quality time with them! So this year, I sent out an e-mail about 2 weeks before school starts and invited them in to meet me one on one. I've already heard from numerous parents that they LOVED that I did that. Seriously guys, take the extra step at the beginning of the year. You will be so glad you did later! Every day, we send home a home note. It goes home in a binder and comes back the next day. One piece of paper holds an entire week, so we aren't killing TOO many trees! You can find my home notes for free HERE. It's super simple! Basically, either my paras or I will circle what the student did that day, any related services, behavior, and write any quick notes that might need to be noted (low on snacks, very tired, etc!). It's a great way for parents to see what their child did at school! Some of my students might not be able to relay that information, so parents love being able to get a little blurb about what their day looked like! I wrote a blog post HERE about how I utilize my FAVORITE app in the classroom! It's such a fun way to keep in touch with parents and allow them to actually SEE what their kiddos are up to! :) I'm looking forward to using it once again this school year! This one is a new way I'll be trying to best communicate with parents this year. I've never used it and have no idea what to expect, but I've only heard good things! If you don't know anything about Remind, it's basically an app that allows you to text parents without giving out your personal number. This will be great if I have information I need to relay before I forget or a picture of a big moment! Have you used Remind with your parents?! I'd love to hear how it went! What are some ways YOU communicate with parents?